Home » Community and Society » Pageants & Beauty » Miss San Pedro 2011 – September 3!! Miss San Pedro 2011 – September 3!! The five beautiful contestants vying for the crown. L-R - Leonela Eiley, Trisha Acosta, Yakarelis Hernandez, Josie Lopez and Christine Syme. Don't forget to come by the Saca Chispas (Old Football) Field to enjoy the Miss San Pedro Pageant this Saturday, September 3, 2011. 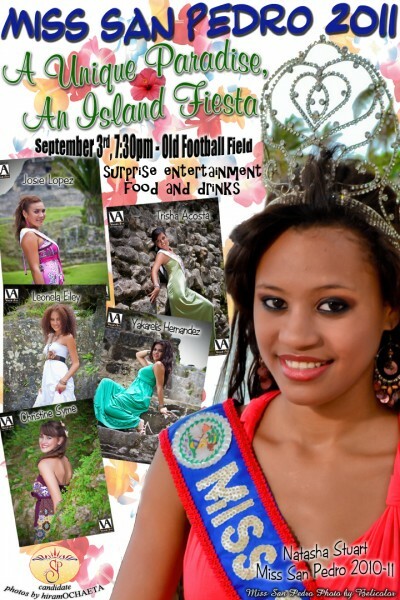 Under the theme: "A Unique Paradise, An Island Fiesta", the pageant is slated to be a spectacular one. Every year, the organizers put on an amazing show, and this year will be no exception. There will be lots of entertainment and surprises throughout the night, so be sure to attend.